Ready for another ARWS dot watching adventure? It starts Sunday at 12 noon Stockholm time (6 hrs later than Toronto/New York) and it sounds out of the ordinary. From racer James Galipeau: "This will be an epic 6-day journey that will start with a rappel from the roof of our hotel in downtown Stockholm (how cool is that!!) and we will make our way to Finland via the Aland Islands. The race will feature some amazing race legs, including a 230km bike stage, an 84km swimrun, kayaking across the Baltic Sea, and close to 100km of packrafting. The race will have live coverage starting at noon (Swedish time) on Sunday, Aug 12th. I will be racing with team WildernessTraverse.com, which consists of my longtime teammates, Harper Forbes, Pete Cameron, and Leanne Mueller." Although they don't log on AP anymore, their AP handles are Relentless (James), Harps, Phatty (Pete) and Leanimal. Obviously, I'll be cheering for the Canadian team. :) My paddling jacket and deck compass will be making the journey across the Baltic Sea with them! You can choose your favourite team from this list. Here are some coverage links. I'll expand this list when other direct links become available like the tracking map, leaderboard, etc. This site includes newsletters, schedule, logistics, estimated leg times, etc. Very useful info for following the race. I found this chart in the News section. Update from a personal AP log: Harps’ bike box was stuck in Iceland and the next flight wasn’t going to Stockholm until Sunday. He managed to get it put on a different carrier so it should arrive before the race. Good thing, as there is other important gear stuffed into the box - wetsuit, shoes, helmet etc. “Very crazy day yesterday getting ready for the www.nordicislandsar.com race. Harper's bike didn't arrive from Iceland, so he spent the better part of 6 hours on the phone trying to get someone to help him get his bike to Sweden. The airline was quick to offer to ship his bike on their next flight - which would arrive 30 minutes before our race start on Sunday! After countless phone calls (most of them repetitive and unhelpful) he finally managed to plead with someone in the baggage handling in Iceland to help him out by putting his bike on a flight with another airline. The first 3 hours of the race will be broadcast live on local TV and online - on the Live Coverage page, I assume. It starts at 11:45 am Stockholm time. Wow, that swim/run looks epic! They’re broadcasting the first part of the race on Facebook Live on their FB page - already in progress. Estonians are leading ahead of Swedish Armed Forces at this *very* early stage. They're doing a great job with the broadcast - a couple of field reporters and a studio where they're dot watching ("The Mexican team is still lost"), showing interview clips and and discussing upcoming race legs. It's really difficult to provide good AR coverage on the fly. It's not a finished production but that wouldn't be possible. Well done! The live broadcast was fantastic! This could be a step change for AR (albeit it was in an urban city where communication is likely to be a lot easier). So glad Team Wilderness Traverse.com got their gear! We think we saw Leanimal and one or two of the guys come off the rappel! pretty good view of the whole course (granted, from about 25,000 feet).. ...looked very cool. I wonder how much local knowledge of the terrain will play into this race. SAFAT, Sweco and the other Swedish teams are leading in their home turf, but Petri Forsman from Multisport.fi spends a lot of time training in Western Finland and I'm sure he has biked that entire final bike leg. Silver Eensaar from Estonia ACE has also done a lot of training there. At first light on Day 2, all teams are on the Leg 3 mountain bike ride. Five teams are now on a Short Course skipping CPs 21-27 (as far as I can tell), including Mexican/American team Teenek Racing, one of only two North American teams. At the front of the race, SAFAT is approaching CP33 with a 1-hour lead over the Estonians, who are about 10 minutes ahead of Sweco. WildernessTraverse.com is currently in 14th place between CP28 and CP29. I haven't found a lot of race news online although Sleepmonsters is reporting. Here's their article about the start. Anyone found other good source(s)? I've been updating the first post in this thread as I find useful links. What is going on - Silva and ACE turned around and are returning to TA3...? ...aaand SAFAT is back at Märket, CP37. Sweco and GAT stopped in the island. Went through all the forecasts, satellite images for weather etc. Seems that race is stopped for now... any official comments anywhere? pics/video about the conditions at sea? Race is stopped due the high wave conditions, expect ferry transport, to where - TBC. That was always going to be the challenge with this route. Any wind and you will get a good bit of swell and those are serious crossings about 10km between some of the islands and I don't think they are high so you would not see your destination setting off. Look at the SAFAT route to Märket half way there before they spotted where they wanted to be and corrected the line. You would not want to be trying it at night unless you were very confident. Looks like they are getting a list at the moment towards the end of the kayak. Yeah - saw the ACE's video and guys were commenting that wave conditions got out of hands. Good call. Expecting the race continue from TA4 with swim-run section. That section where they had to climb the packrafts up the rope ladder over the dam then throw in the rafts and leap down into the water on the other side was pretty cool, but looked tough. “Kayak leg canceled for safety reasons! In the video, some teams carried their packrafts up the Hammarby ski hill and others didn’t. Were the rules not clear, or did they choose to do this to avoid backtracking to retrieve their packrafts? Ifor - /../ Look at the SAFAT route to Märket half way there before they spotted where they wanted to be and corrected the line /../ . 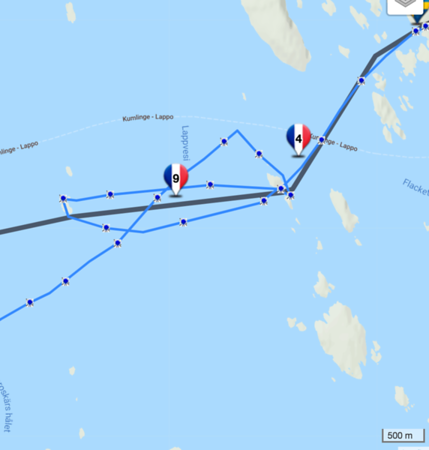 My guess is that their route was more or less intentional - they probably have proper sea charts for that kayak leg and while tracking map is quite blank, there's actually a line of sea marks forming kind of an arc from Understen to Märketthat, correction point seems to be at or really close to Märketskallen lighthouse. Not sure what was going on then but WT is moving now. What I can't figure out is why they're on the Short Course. It appears they took the ferry from near CP34 without making it to CP35/TA3 but there are several Long Course teams who did the same thing, e.g. Pacaraid. Once organizers cancelled the kayak section it looks like they redirected them to the ferry from CP34. Here is Sleepmonsters on the kayak cancellation. "To keep the race as fair as possible teams will have a time adjustment added to their finish time to account for the time they were behind the lead team as they arrived into TA3 at Singö." That's a reasonable compromise but there's no way to level the playing field. The five lead teams get no credit for the 4-5 hours they paddled in rough conditions but that took its toll. Sleepmonsters mentioned that a member of Team Greener Adventures got very cold on the paddle and the team has slowed down as a result. I just heard from Cara, James' girlfriend, who is volunteering at the race. She answered Carbon's question. Team WildernessTraverse.com had put two of their swimrun wetsuits into their TA3 bin but they were redirected to the ferry before TA3 and then they had to wait 4 hours for that bin to arrive at TA4. I'm guessing that a couple of them may have been thinking of wearing the wetsuits on the kayak leg. I wrote organizers to ask why WT.com would be on the Short Course when there were 4 Long Course teams that also missed TA3 after being sent directly to the ferry. I don't know if it will stick but the leaderboard has been updated and WT.com is back on the Long Course again. It looks like organizers may not be assigning time adjustments to teams that did not start in the 1st wave. It looks like WildernessTraverse.com has cracked the top 10 although I’m not sure the leaderboard rankings from 8th-11th are all accurate with the time adjustments right now. Thanks for the update Bash! What a bummer about the wait for the wet suits. It would have been fun to see WT traverse re-start with wave 1, but they are moving well and it's fun to see them climb up the ranking. Check out the tracking board right now! It looks to me like team #12 Agde Raid Adventure didn't get CP59. If this is on purpose so that they make cut-offs that I'm unaware of, that's one thing, but if they just missed it WT may catch them if they nail the CPs here! Yeah, but they just jumped up on the leader board to 9th. I'm dying to find out what is going on behind the scenes with time credits, placings, time cut-offs etc. Fun little race within the race to follow! Sleepmonsters Facebook has published some of the maps including the final set a few hours ago. What a cool area for navigation! They're expecting the winners to come in around midnight local time, which is a few hours away. The best maps I've ever seen for a race, including the ancient maps for the pre- and post- race city O' courses. Those are so cool! Their ‘regular’ maps are equivalent to most o-course maps. Their ancient o-maps are similar to our USGS maps, lol! Now that I'm back on my computer, I see the former "Timing" menu item (leaderboard) has been renamed to "Unofficial". Having managed a number of real time AR leaderboards, I'd say that is always the correct title! As SAFAT arrives on the outskirts of Turku at 22:00, the Estonians are 20 minutes behind + 80 penalty minutes, if I understand the unofficial leaderboard correctly. Pretty close race at the end here! That final foot-o should be pretty straightforward, even with the old map. It's all along the river and the town is nicely laid out on a grid. As long as SAFAT has any footspeed left, they should hold off ACE. With 80 penalty minutes to be added to the Estonians' time, SAFAT will win but I'm sure they'd like the honour of crossing the line first! Though I forgot about the penalty minutes for ACE. SAFAT can coast, though it would be nice for them to finish first. Amazing how the front two teams have distanced themselves from Haglofs Silva...does anyone know what the penalty difference is between them and Multisport.fi? 3rd place Haglöfs Silva is about 4 hrs behind SAFAT + 108 penalty minutes, so these two teams have really distanced themselves from the pack. Multisport.fi has 143 penalty minutes compared to 108 minutes for Haglöfs Silva. The last team is off the kayak section - the all-female team, Downtown Camper. I can't remember, but maybe they are using the old style maps again.....in which case the Swedes would have more trouble navigating than they did in Sthlm. Most Swedes know the old town of Sthlm really well but not so much Turku. Looks like SAFAT is skipping CP92. Does anyone know the time penalty for a missed CP in this final section? Maybe they have a big enough buffer. I think SAFAT actually found CP92 and that the map tracker is just off. SAFAT's CP checklist shows that they have collected CP92 but the leaderboard doesn't. Their breadcrumb has gone to it so they must have got it. ACE to cross the finish line first then - party poopers! Both teams across the line now and SAFAT takes the win over the Estonians! I don't see SAFAT's breadcrumb at CP92 but their tracker could easily miss that. The Estonians crossed the finish line 12.5 minutes ahead of SAFAT. Haglöfs Silva is now 4.5 hrs from the finish line if they move at SAFAT's pace. They have about 90 minutes on 4th place Multisport.fi minus 35 penalty minutes (the difference between the teams' penalties). I think SAFAT is on the move again. Perhaps going back to find CP92? It appears the SAFAT missed 92...they have just run back out and punched that CP. Wonder what the final time will be ... it's going to be very close between them and Estonia! Wow...looking at the times, SAFAT may just squeak in with a bit of time to spare to stay in front of Estonia's time (with 80 min time penalty). They have to finish by 00:59:40 and are moving back to the finish now at 00:23. Estimate they'll finish by 00:40. Whoa! That's a tight finish after ~85 hours of racing! As a navigator, my stomach just lurched in sympathy. SAFAT isn't the only team backtracking. WT turned around for some reason and are now back to where they were 1 hour ago. The WT backtrack is a bit strange as there is no CP in that area. Re: WT backtrack: has anyone checked the maps for one of those compulsory brackets that indicate a route that must be taken? There were lots of those on the maps for the packraft stage. SAFAT takes the win - for real this time - and they're a little embarrassed. The final gap was 23 minutes. I looked at the maps posted by Sleepmonsters and there are not mandatory route elements that appear to have been missed by WT. I'm going to guess they passed a good spot for a sleep, then not long after decided they needed sleep and returned to the spot rather than sleeping in the bush with rain(?) and whatever else. WT has stopped. From an aerial view, it appears there are buildings so Conman may have it right. Or maybe a pack raft problem? Weather is fine but it's dark so it's a good time to rest. Looks like their closest competitor 22 Greener has also taken the opportunity for a kip, and quite close by. I bet neither team ever knows of this cooincidence. Greener Adventure has been resting quite awhile. They're one of the 5 teams that started the first kayak section and one of their team members got really cold, which slowed them down. They have 113 penalty minutes and it appears that WT has none. WT has been resting for 3 hrs now. The sun rises in 2.5 hrs so I'd expect them to start moving in the next hour or so. The Greener Adventure Team has been stopped nearby for 9 hours! Meanwhile back in the mangroves, 3rd place Haglöfs Silva is about to visit CP92 (hopefully) and finish the race at sunrise. 4th place Multisport.fi is on the outskirts of Turku. There's almost a 6-hr gap to 5th place Hamilton Adventure Racing. Sweco is less than an hour behind them with 121 fewer penalty minutes. Fun fact: Phatty invited Leanimal to do an adventure race as their first official date. Additional fun fact while we wait for more race action: Phatty and Leanimal put on a family-friendly adventure race in the hours before their wedding at a summer camp. I was responsible for figuring out the results, which was fun because I got to make up categories, e.g. "Team With Baby". The overall winners were Dave and Nuala Zietsma. Longtime AR fans may remember Dave as the captain of a successful Canadian EcoChallenge team who had his wedding ring cut off on TV after an injury. I hope all is okay with #22, Greener AT. They have been stooped for a very long time. They just started tracking at 5:30! But they haven't gone anywhere yet. At least someone has moved their tracker. Haglöfs Silva has arrived safely at the finish in 3rd place and their GPS track proved their visit to CP92. :) Their track also shows the 90 minute period this morning that they'd probably rather forget. Seeing as there are no CPs in that stretch, there must have been a mandatory passage that they missed somewhere in there. Or, they dropped their compass in the ocean and it took a few hours for it to come right again. Looked it up: Yes, Silva missed two mandatory passages: one directly at the spot where they turned back to the East and the other at the spot where they turned back almost due West. I can only assume that they hadn't recalled/noticed that these were on the map until they got to the Eastern one, whereupon they checked to see if they had missed any and...the wacky track ensued. The Greener Adventure Team is moving well on the course after their 11-hour break. Actually, on the last O' section, Silva made a heart with their track in that little park...just to honor their good friends from SAFAT, I'm sure. WT is shown as 10th on the leaderboard after CP72 but if penalty minutes are applied as shown, they should be 7th now. We'll see what happens. Go, go, go! Hamilton Adventure Team has gained a few hours after Sweco stopped at TA8 to sleep. Will their respective decisions pay off? Hamilton might just skip CP92 in their sleep deprived stupor. It could happen...again. Do you think that skipping CP59 will be ignored in the final ranking of the teams? WT and several other teams skipped it. Haven't done the homework about which others, however. I was wondering the same thing Conman. CP59 may come in and play a role in the final placings. Agreed, that may have something to do with the Unofficial status of the leaderboard. Organizers wouldn’t have much time to think through complex timing issues like that while the race is happening. Maybe a cut-off was introduced or perhaps CP59 was optional for some kind of extra credit? I think WT may have missed CP73 as well. I'm not seeing any time stamps for that in their details. I suspect SWECO may see some adjustments too becasue it appears as if they missed CP77 and 78. Carbon: I think you may be right about WT missing CP73. Their track definitely diverges from the route needed for the geofence to show that they grabbed that point. However, they do hit land several hundred meters North of the CP along the western shore of that island, then stall there for about 20 minutes. It is possible that their tracker was in a boat, and they ran out-and-back to the CP to punch without the tracker. Yes, that is a good point. Fingers crossed. That's what it looks like. They had plenty of time to run to CP73 and get back to their pack rafts. Geofencing is convenient but it can miss things like that. WT now has a 180 minute penalty. They'll be the next team to finish in 3-4 hrs, possibly in 9th place although Greener Adventure is moving well and their penalty is smaller. Regardless, they've raced well! Agde is back ahead of Fenix again, for whatever that's worth. I know from being on the other side that it's not over until it's over - and even then, it can take awhile to unravel the leaderboard spaghetti! Until organizers check the passports, they won't know for sure which CPs teams visited. And then there could be protests about time penalties/credits. Prizes have only been announced for the top 3 teams and those rankings seem pretty clear, so hopefully racers will understand that organizers were faced with a complex, difficult situation where it will be impossible to make everyone 100% happy with penalties/credits. I know some racers find that kind of thing hard to accept though. The penalties difference between WT and Greener is 67min ...meaning WT has to cross the line atleast 67min before Greener to stay ahead of them in the rankings. Looking at the time difference at the last CP visited by both teams (CP80); WT punched it 69min before Greener ...only a 2min lead. WT now has 300 penalty minutes now so they are probably destined to finish behind Greener Adventure. Interesting to see that a couple of teams who were on the Full Course late last night (my time zone) are now on the Short Course: Adeorun and Hamilton Adventure Team. They actually measured everyone's bike boxes?? Wow! Where can you see those details? I wonder if it has something to do with the size of box you can fly with. Oh, I see - it's at the bottom of WT's Routes and Splits window. Curiosity got the better of me and it appears that the only teams assessed this penalty are international ones! ...perhaps there is some truth to my earlier quip. Ugh, I can't even laugh at that because I've seen firsthand that some racers really think that way. Although there are a handful of teams with the bike box penalty, none of them from Sweden, so you may be on to something, lol! ...I feel you know me well enough Bash to know I'm certainly not one of "those racers"
Wow , a penalty for the bike box size. To me that is a bit too much. Having raced many races and helped in many, I fully understand the practical logistics of a race and managing equipment transport etc. but if the bike box size is that much of a concern, then I'd say you can't start the race with a box that doesn't meet the requirements. Maybe there is more to this story that we know at the moment. Four teams got that penalty. Since none of them were Swedish, I wonder if teams flew in with bike boxes that their airlines would accept. The rules for the size of the boxes changed a few years ago with the new rules stating a smaller box. I have seen multiple instances over the last few years of people still using the old boxes. I have never seen anyone penalized for it. Team WT has passed through the finish area and is now headed out on the 7 km run through town on the ancient map. Cara says they're in great spirits although Phatty's feet look sore. :) Looks like WT is taking the scenic route to CP90. Be sure to visit CP92! Cara heard that two teams hopped on a ferry at some point and will be assessed penalties that may not yet be on the leaderboard. I'm guessing they're further back in the pack. Okay ...bring it home kids! This is one split where they'll *crush* SAFAT! Too exciting! Gotta get some work done, but can't stop watching, especially in the final minutes! ...so long as they don't miss the "Daisy" along the way. Last CP. I know the maps are old, but so are you, so you've got this! Ha, nice Daisy! How can they miss it?! Bender is doing a fine job "navigating" from afar, providing detailed pictures of the check points! ...now I can't leave until they cross the line! They've just passed The Daisy! Thank you Phatty, Leanimal, Relentless and Harps for thinking of me and allowing me to leave the office by 5pm. Amazing! Well done WT! Can't wait to hear the stories! Wooo hooo!!! Congrats WT!!! It looked like an incredible race, and you guys did AMAZING!! Love that you put the Canadian flag so high in the rankings! Yes! Congratulations - really well done! Greener Adventure is running around Turku on the ancient map. No chance they'll fritter away all those penalty minutes so it looks like it'll be 10th for WT. Unless SWECO still gets penalty minutes for missing CP77 and 78.....although that may still not add up enough. Good point. The race organization may not have checked all the passports yet. Sweco has a time bonus right now. Greener is currently running in circles near CP92 but hasn't found it...Could this be a repeat of SAFATs midnight on the city yesterday? Wasn't there a photo of Phatty before the race, looking tired? So racing just makes him look happier? Wow, WT, you guys look great! #4 is approaching the finish now. Only 5 teams remain on the pack raft leg, but they must start to sense how close they are to the TA now. All teams are off the pack raft section this morning. Team #19 Downtown Camper are still going at it. Am amazing bunch of girls! Nice. Checking the remaining team's breadcrumb trails, looks like almost everyone is moving well through this last bike leg; although, "Whats Your Dream" seems to be slowing a little, perhaps a little sleepy after almost 5 days. Oh how I'd love to be riding through some Scandi country side right about now. The roads and woods over there always seem so "groomed" and instill a sense of tranquility and relaxation ...even if you're bombing hard through them on foot or two wheels. I hear you Bender. This is the first race in a while that has me itching to get back to expedition racing. I grew up in Sweden and have always wanted to do a race there. I'm not really sure why I haven't. I wonder if they'll put on another one. This race seemed like a unique journey. I'm wondering about how the Teenek team have endured. Their race started with trouble on the Stockholm O' course, they skipped a large section of the first bike leg, ended up on the last ferry to skip the first kayak, then fell behind and skipped part of the swim-run as well. They are not the lantern rouge exactly, but they sure have had a huge experience. They have perennial goof-ball JD Eskelsen from the US racing with them, which has to have been a blast! 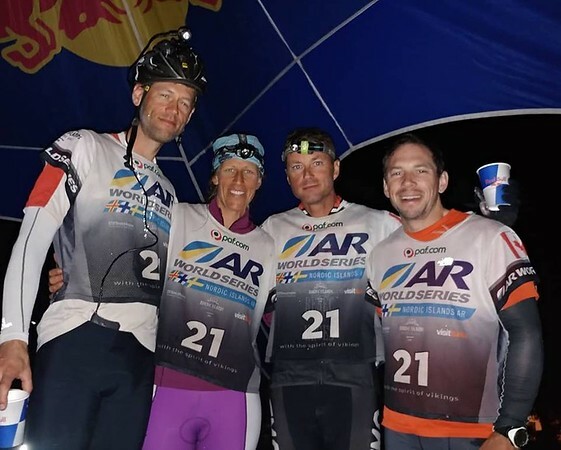 The last teams are now thru and I have an observation to make that I'd love to hear some discussion about: this is the first expedition length race (ARWS and non-ARWS) I have witnessed in more than 5 years of regularly following events where there were ZERO teams that DNF'd and apparently zero racers that dropped out while their team continued on. This race was big and clearly plenty difficult. So, how did this happen? What was unique about this race, the racers, the location, or race mgmt that made this possible? Don't get me wrong, I think this is really fantastic. I just want to understand how it has happened just this once over so many years. I was similarly impressed by Untamed NE, where there were almost no DNFs. One of the two DNF teams was a team of two where one member dropped out and the other joined a different team. The 2nd DNF team was turned back by strong currents on the paddle. In my experience of working at HQ and listening to post-race stories from events I've done, most DNFs happen in situations where there is an option to not DNF, e.g. "We stopped and made a fire during a really cold night when we couldn't figure out where to go and we still had time to finish the race even though our ranking would be lower - but we were done." - Incredibly good luck with injuries, hypothermia, etc. Of course, this isn’t all luck. Good mandatory gear lists and pre-race info can help but anybody can fall off a mountain bike so you still need luck! - Racer mindset: I’ve been thinking about this one a lot, given that we usually have more DNFs in 30 hours at Wilderness Traverse than we had in 5 days at Untamed. Racers have invested a lot in preparing for and traveling to an expedition race, and they know their teammates have done the same, so that probably helps to keep them on course. Some of the difference is training but I suspect a lot of the difference is mindset. It doesn’t bother people as much to drop out of an overnight race close to home. I’ve been wondering if we could do something more to discourage dropping out but I don’t know what it would be. Another post-race thought: I'm sure a lot of the teams are currently reviewing the penalties and time credits for this race since almost everyone was affected. For the record, this race seemed really well organized and they faced huge challenges in administering time credits/penalties. Based on what I've seen from a distance (although no race reports yet), I would happily sign up for an event put on by this organization. Sometimes time credits/penalties are unavoidable, e.g. in this case when teams were restarted together after the cancellation of the first paddle leg. Sure, they could have been held to recreate the appropriate time intervals but that would have held up volunteers who were probably needed more elsewhere. Also, the restart location may not have been an appropriate place for a group of teams to spend a long period of time. - WT weren't aware of their penalties until the race ended. As spectators, we know their penalties were added late in the race, and it probably took organizers that long to sift through all the information while the race was on. However, in an ideal situation, teams should know where they stand relative to teams they see on the course. That is, they should know their own penalties/credits and they should know the penalties/credits of teams they may encounter. This allows them to plan appropriate sleep strategy, increase/decrease pace, etc. Even in cases where penalties/credits are clearly stated in advance, e.g. a 1-hr penalty for a missing mandatory item, it is still hard to get that info to all teams who need to know, i.e. the team affected and all teams in their vicinity. I've done this sometimes but with poor communications and competing priorities, it's easy for this to happen late or not at all. - You can't use time penalties/credits or leg cancellations to level the playing field exactly between teams who *did* something (visited a mountain top CP, paddled for 5 hours on a rough ocean, spent 3 hours looking for a missing CP flag) vs. teams who didn't do that thing. Team Greener Adventure was profoundly affected by their experience on the first kayak leg but the time adjustments were based on arrival time at the bike/kayak TA, so it's as if their paddle never happened. This was a reasonable compromise but their ranking took a big hit because the teams chasing them hadn't done that rough paddle. There are other factors. A time adjustment isn't equivalent to spending that time racing on course, e.g. it may mean a team does a section in daylight vs. in the dark, or they get better/worse tides. There are situations where credits/penalties are necessary but it's best to avoid them if possible. This may sound harsh but after seeing it enough times, I think time credits should not be awarded for dark zones, storms, etc. - situations for which Mother Nature is primarily responsible. Some teams will argue that they should be allowed to paddle Class 4 rapids in the dark but the RD gets to decide. Period. When teams are stopped, they are getting a break from physical effort (albeit perhaps an unwanted one) and they may have access to gear bins and sometimes even stores and restaurants, so it doesn't level the playing field to just subtract that time from their race time. Teams that keep going non-stop have different conditions (e.g. dark/light), they're taking breaks on the clock (possibly in uncomfortable locations), they just have the gear/food they brought with them (unless they pass a store), and they can't see a team that might be "just behind" them based on arithmetic. Every situation is unique and teams on either side of the stop will be hard to please with time adjustments. Adventure sports are unpredictable and dependent on outdoor conditions; that's what we sign up for and if we get stopped for some reason, we need to accept that we could have avoided the stop by racing faster. Where penalties can be served on the course safely, that's preferred so teams will know that the teams around them are racing them directly. Time credits are trickier. The race organization should probably credit teams whose bikes and gear bins are not delivered on time but that is approximate and you sure wouldn't want a race decided by a few minutes because of this. We can often complete some TA tasks (washroom break, refilling hydration bladders) without our bins. Also, it's rare to get exact times for this delay from the TA volunteers. They have too much else to do. As mentioned, teams racing in the vicinity of teams with credits should be informed, which may be difficult/impossible. One suggestion for improvement in this case: The bike box size penalty could have been assigned before the race, maybe when there was still time for racers to borrow/buy/rent a different box. That penalty information could have been shared with all teams before the start so they would know which teams were carrying the penalty. I wonder if came up late because there was some additional cost to the race organization for transporting the bigger boxes on the ferry. It's strange that it arose so late but maybe it was one of those things that slipped down HQ's "to do" list. Got the skinny on 2019: Nordic Islands AR will traverse Sweden and Norway over six to seven days in July.